Webpage Printing Tips simple instructions showing how to customize printing of the date, time, web address URL in the header and footer and how to print in internet explorer with no header or footer. You can print in internet explorer with no margins, the time, date, web address URL or page numbers. 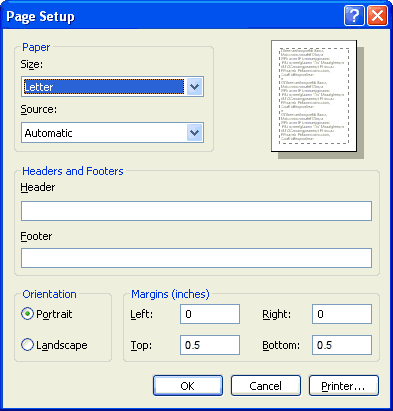 You enter codes to customize the headers and footers to print your pages as you wish them to be printed. There are simple instructions complete with pictures and a chart of special codes for the page setup. In Internet Explorer go to File, then Page Setup, find the section labeled Headers and Footers. So you can return it to its original state copy down on a piece of paper the characters listed under the Header and Footer fields. Then delete all of the characters in the Header and Footer fields. See the first image below as an example of what you may find entered there. 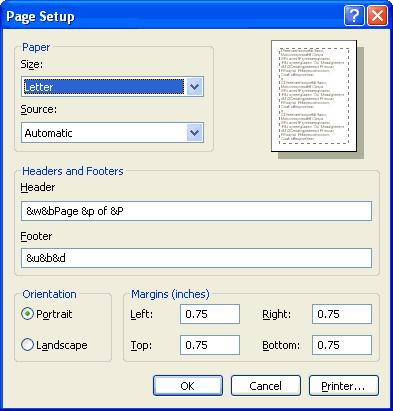 Next you want to set the margins to zero 0 so that the whole page can be printed from top to bottom and from the left edge to the right edge. that should do it, see the second image below as an example of how it should look when you are finished. If you don't set the margins to zero 0 and you try to print the whole page you will end up with a white border all around the page and the images cut off. An example of what you may find in your page setup properties tab. How it should look when you are finished. &b&b = By using 2 of these codes what comes after the first "&b" gets centered, and what comes after the second "&b" goes to the right. For example "&b&d&b&w" if I wanted the date centered and the window title to the right. Using these simple instructions and codes in your webpage printing can help you to customize how your webpages look when printed.